How the Hindenburg went from luxury airship to gargantuan fireball wasn’t the only mystery surrounding the zeppelin’s fatal flight. First came the murder. 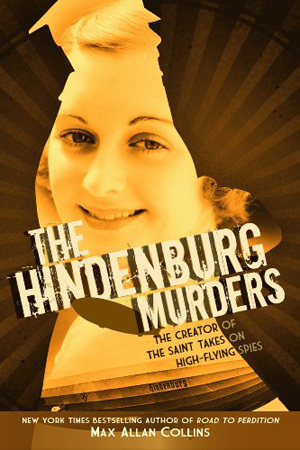 When a passenger vanishes during the Hindenburg’s trans-Atlantic voyage from Frankfurt to New Jersey, mystery writer Leslie Charteris is asked to use his knowledge of the criminal mind to quietly pinpoint the killer. Charteris is famous for his fictional detective, the Saint, who extracts riches as well as vengeance from evildoers in true Robin Hood fashion. But in this case, the villain turns out to be the murder victim himself—a Nazi spy. And the list of passengers who might want him dead is long. 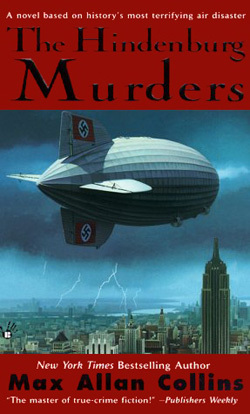 Suspecting that sabotaging the German airship is the killer’s true aim, Charteris must solve the murder before innocent lives are engulfed in flames. 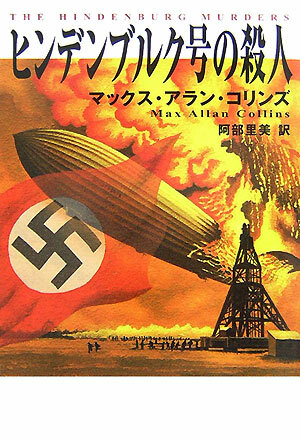 Reconstructing the zeppelin’s fatal flight on the eve of World War II, The Hindenburg Murders proves that Max Allan Collins is the master of hard-boiled historical fiction. The Mystery Reader: 4/5 Stars. "a very clever pairing of fact and fiction…to be enjoyed by fans of historical fiction and mysteries alike." The Whodunit Pundits: "I found the plot was engaging, thoughtful and far from predictable. I love a historical twist in which you want to explore the places and circumstances to learn more." Kindle Post: Max Allan Collins on The Disaster Series. December 21, 2012.